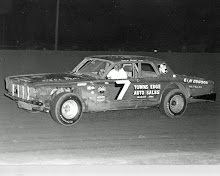 Des Moines, Iowa (July 9, 1977) - Curt Hansen of Dike was up to his old trick of winning features Saturday night as he captured the mid-season championship at the State Fairgrounds. 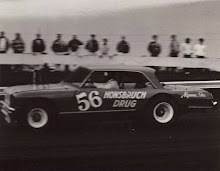 Hansen, driving a 1977 Camaro, charged out of the front row and led all the way for a 50-yard victory before a crowd of 6,500. Hansen, who earned the pole position by virtue of leading in the point standings, held leads of up to 200 yards over Ed Sanger of Waterloo. Only a yellow flag on the eighteenth lap slowed Hansen. So what does a driver do when he has a comfortable lead? "Unfortunately, having such a big lead can lead to bad things," said Hansen. "A comfortable margin always makes you nervous. "But tonight everything clicked. The car has been perfect for the last week. We've made changes, such as changing the weight in the rear end and altering the tread whip and we've either finished first or second." Hansen, who has captured four features wins here this season, pocketed $750 for his effort - $550 for the feature, $150 for lap money and $50 for a third-place finish in the second heat. 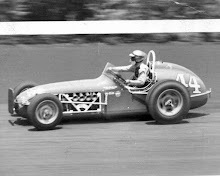 Bill Rice of Des Moines finished third and Joe Merryfield of Des Moines, still seeking his first feature triumph here this season, was fourth. Rocky Hodges of Des Moines jolted season point leader Bill Davis to capture the sportsman mid-season championship in a race that had five caution flags. 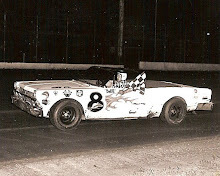 "This is the best I've ever done on a half-mile track," said Hodges, who passed Davis on the straightaway of the sixth lap and held the lead for good. "We put in a new intake manifold and it was also the first time the brakes have stayed on during the entire race here," added Hodges, who drove a 1971 Camaro. 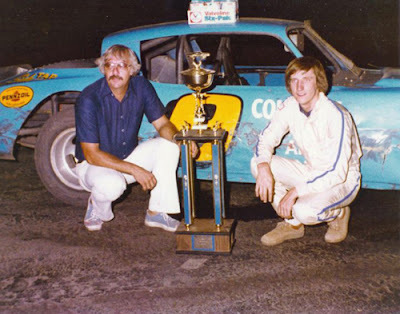 Davis, in a 1972 Camaro, pulled to within 10 yards of Hodges on the seventh lap, but fell victim to a restart and edged Rick Merryfield by a bumper to claim second place. "Rocky's car was running better than mine and it got hooked on the track," said Davis. "We got caught when they started the race again and we had two different tires on the front." 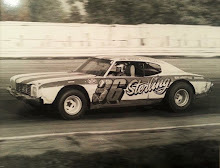 Denny Rosenberg of Grimes captured the first sportsman heat and was making a move from his sixth position on the seventh lap of the feature when he encountered car problems. "Something in the transmission locked," said Rosenberg, "and there's no telling how good we would have finished. "I thought it was the best we've run out here all season," added Rosenberg, who is sixth in the point standings.